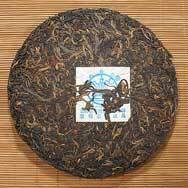 This tea is now one of the most sought after Pu'er in the market. 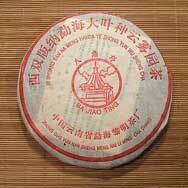 Bajiaoting Yun Wu Bing Cha was a custom made tea for Mr. Wu, a seasoned Pu'er tea connoisseur. 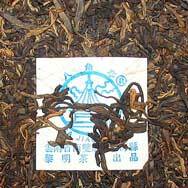 In 2001, Mr. Wu personally selected the tea leaves and commissioned Li Ming Tea Factory to process and compress them for him. Now, after some years, his expertise is finally beginning to show, for this tea is aging extremely well and some experts are thinking that it has potential to become a great Pu'er tea one day. Supply is rare and chances are the price will continue to climb, making it a very good buy for collectors. The infusion has a smooth mouthfeel and a light hint of plum fruit taste. Excellent leaves, charming smell. I wish to buy some more and keep them. Now is the time to get it for a reasonable price which will surely rise over time. This is a simple but enjoyable tea. The leaves are attractive and give off a nice scent with barely a hint of smokiness. The brewed tea has a refreshing and welcoming aroma of floral fruit (plum?) with a bit of camphor. The brew itself is dark golden, it’s smooth, flavors of olive and camphor with a little bitterness (I brewed gongfu style in a 5 oz pot with a lot of tea, perhaps I will put less tea or shorter time), which I actually enjoyed. It leaves a nice aftertaste with a hint of the camphor. There’s not a lot of depth but it’s a very pleasant drink and certainly a good value. I recommend it. Some where in between black spanish olives and plum. The olive is more penetrating and the plum is not up front. Nice, but certainly not as friendly as a black pu-ehr of similar quality. I was surprised at how enjoyable this tea is already. Very solid. very dark chestnut color,no bad odor,not cloudy.slight plum after taste.I like it.Its already to drink now. ?May improve with more aging.